"No life support? Hahahaha! Pull the plug! Pull the plug! Anybody that dumb DESERVES to die!" Monkeybone is the creation of an artist named Stu Miley (Brendan Fraser), a man whose nightmares were cleared away by sleep specialist Dr. Julie McElroy (Bridget Fonda), now his girlfriend. After a party promoting the new animated TV series based on Stu's comic strip, an unfortunate merchandising-related accident sends reluctant licensor Stu into a coma. His soul takes up temporary residence in "Downtown," a halfway point between the real world and the afterlife, where he encounters forgotten gods, retired advertising icons gone to seed, a sweet feline waitress named Kitty (Rose McGowan), and Monkeybone himself, assuming the form of the stuffed monkey toy soon to be in toy stores everywhere. Hypnos (Giancarlo Esposito), the God of Sleep, informs Stu that his only hope is to secure an exit pass from Death (Whoopi Goldberg). Meanwhile, in the real world, Stu is threatened by the "no life support" pact made long ago with his sister Kimmy (Megan Mullally). Unforeseen, body-switching circumstances pit Stu against Monkeybone, who plans to fill the world with nightmares to entertain the denizens of Downtown. Director Henry Selick (Tim Burton's The Nightmare Before Christmas, James and the Giant Peach) brings his animator's sense of design to the world of Downtown. Flying Grim Reapers, human-headed pigeons, Harryhausen-esque messenger gods and other characters are realized with energy and imagination, and the Downtown sequences bear repeated viewing. The film bucks current trends in special effects, eschewing computer graphics for the most part in favor of stop-motion animation, physical sets, and some amazing live-action creature suits. It's a refreshing change, though apparently some of the footage was cut because production executives didn't like its obvious foam-rubber, puppety look. But Downtown is a feast for the eyes and ears. The real world is treated naturalistically, with occasional colored lighting adding a touch of hyperrealism. It's an appropriate choice, but it is here that Monkeybone ultimately breaks down. Stu's fight to return to the "Upworld," where he was on the verge of proposing to Julie, is motivation enough; the "nightmare plot" hatched by his hominid creation seems wholly unnecessary, diluting the story's romance and comedy with a "ticking clock" plot device that makes the third act resemble too many other movies. The movie was loosely based on Kaja Blackley's graphic novel Dark Town, though the story underwent significant changes�Stu was originally a puppeteer, and Monkeybone himself is a creation of scriptwriter Sam Hamm. Even with these alterations, pre-release gossip, design sketches, deleted scenes and Selick's DVD comments indicate that Monkeybone was originally intended to be darker and more adult, with a taste of the raunchiness and offbeat eroticism of underground comix. Executive "guidance" drove the film into PG-13 territory, apparently so it could be marketed to what Fox perceived as the South Park audience (never mind THAT feature's rating), with some worthwhile footage dropped to keep the MPAA rating teen-safe. The end result is an unmarketable film, too tame for the midnight-movie crowd and too juvenile for a broader audience; the darker ideas and sexual humor are largely gone, but the fart and cleavage jokes remain. The end result has a stifled, schizoid sensibility, unlikely to satisfy anyone completely. Good performances from a talented cast help the film make its way through the morass that remained when creative wills collided in production. Brendan Fraser approaches "the top" in several scenes, though he never quite goes over it; Bridget Fonda makes the most of a thankless "straight girl" role, and Whoopi Goldberg plays herself to great effect as a cantankerous but essentially warm-hearted Death. John Turturro (in accelerated form) provides Monkeybone with a wisecracking, cartoonish but emotionally modulated voice, and Dave Foley is great fun as Herb, Stu's unctuous, money-driven friend/manager. But the real find here is Chris Kattan, who plays a possessed corpse with complete commitment and incredible physicality�his broken-necked escape from a hospital is marvelous and hilarious, an odd but entirely successful combination of Buster Keaton, Bill Irwin and a Romero zombie. His character's necessity to the plot is questionable, but the film would be much poorer without Kattan's presence. 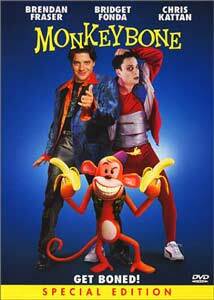 Monkeybone failed miserably at the box office, but it's not a total loss. Fans of the bizarre and creative will thoroughly enjoy its best elements, and its weaknesses aren't as bad as one might assume. Selick's film takes some risks that don't always pay off, and skittish studio execs preempted many other risks. Still, the risk-taking that survives onscreen is admirable, if not entirely successful. Image Transfer Review: Fox presents Monkeybone in its original 1.85:1 widescreen theatrical aspect ratio, with a solid anamorphic transfer drawn from a pristine source print. Some shots seem overly soft, but this appears to have been an intentional choice by the filmmakers, perhaps to maintain a consistent look where multiple elements are composited together. Color is rich and the digital transfer handles the film's stylized lighting with no distracting compression artifacts. Not the most impressive transfer I've ever seen, but it meets the standard expected of a recent theatrical release on DVD. Audio Transfer Review: Monkeybone features a variety of soundtrack options, with English Dolby Digital and DTS 5.1 tracks as well as Dolby 2.0 Surround audio in English and French. Both 5.1 tracks feature impressive dynamic and frequency range, a boon to Anne Dudley's Elfmanesque score and the pop tunes frequently called into service to support the action (with and without irony). LFE bass is used sparingly but effectively, and some sequences feature great little audio touches that are well-captured in the 5.1 mix. The DTS track has a slight edge in the imaging department, though all the soundtracks are fairly front-oriented, with the surrounds used for atmosphere and occasional gimmicks. The 2.0 tracks have a flatter, "matrixed" character, losing some richness along the way, but are otherwise suitable, though the French track suffers from approximate lip-synch and strained performances. A solid digital transfer, though not quite in the best-of-the-best league. An extensive collection of stills provides a visual record of set design, character evolution, and props and comic strips seen only briefly in the film. The gallery also includes several brief, silent "creature test" video clips revealing the puppeteering involved in realizing several key characters. It's a great look at the extensive production design effort invested in Monkeybone. Raw live-action and animated footage from seven sequences provides insight into the painstaking process of combining freestyle footage with stop-motion animation. It's interesting to see the support rods, green-suited puppeteers, and motion-control rigs involved in pulling Monkeybone off (a process that is to Who Framed Roger Rabbit? roughly as Star Wars was to 2001: A Space Odyssey), and this section preserves some animation footage left on the cutting-room floor. Optional commentary by director Henry Selick provides additional information, though the visuals generally speak for themselves. This section presents eleven scenes that were shortened (often significantly) or cut altogether for theatrical release. Director Henry Selick provides optional commentary, making it clear that he preferred the longer versions in most cases. The scenes are presented in non-anamorphic format; most are drawn from film sources (with some dirt and debris), though a few are taken from low-resolution video output. Some of the scenes are unfinished, with crew members digitally obscured, and at least one naughty bit is covered up, apparently in keeping with the film's PG-13 release rating. The extended sequences answer several conundra presented by the film as released, and an extended opening cartoon and tonally different ending suggest that the film might have been better had Selick been given free reign. Some very funny gags were also cut in the process; I don't think the inclusion of any of this material would have saved the film, but this section does present evidence of detrimental studio interference. Director Henry Selick contributes a running commentary, crediting many of his collaborators�animators, designers, actors and stunt supervisors are all given their due. Selick also takes the opportunity to criticize the movie's production executives with equal vigor. One gets the impression that executive producer Chris Columbus (Home Alone, Mrs. Doubtfire) and Selick clashed at every turn (not surprisingly; imagine John Hughes working with Tim Burton), and that neither Selick nor the studio heads were particularly happy with Monkeybone in its final form. It's also an interesting commentary from a filmmaking perspective, acknowledging a wide variety of pop-culture influences, but most memorable are Selick's thoughts on making a "film by committee" that "frightened" the studio. Kudos to Fox for letting Selick speak his mind, and to Selick for sharing a few hard Hollywood lessons with us. Monkeybone is an uneven but visually impressive comedy, with a sense of the bizarre that almost makes up for serious story problems. Fox's DVD features a solid transfer and substantial design/FX supplements. Flawed, but worth a rental.